Members of the Army Reserve Marksmanship Program competed at the 2015 U.S. Army Forces Command Weapons Marksmanship Competition through September 23 at Fort Bragg, North Carolina. The FORSCOM event represented all components of the U.S. Army. In the final tally US Army Reserve Competition Program members won two of the three events, with a USARCMP member placing second overall in the third event. In the M249 Squad Automatic Weapon category, Capt. Dustin Duncan, a Blackhawk helicopter trainer at the National Training Center was top overall. In M4 match, Capt. Kirk Freeman of the 518th Infantry Regiment and USARCMP member won. For M9 pistol, Master Sgt. Russell Moore, 416th Theater Engineer Command and USARCMP won. 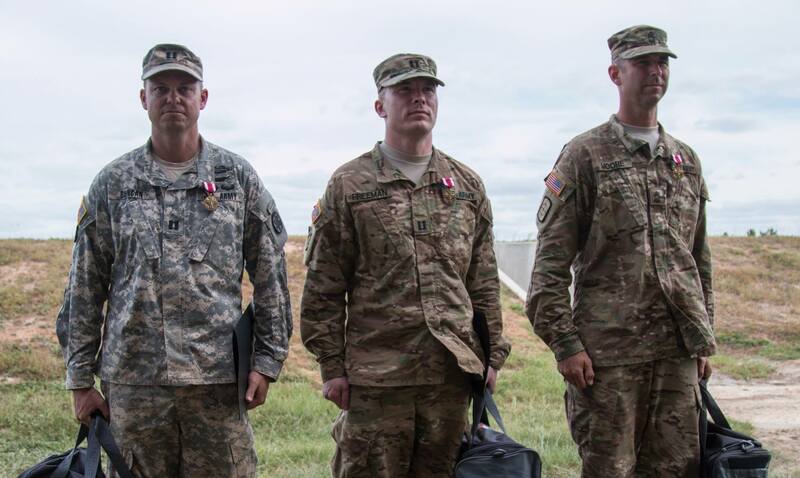 From left, 2015 FORSCOM Marksmanship Competition winners Capt. Dustin Duncan (M249), Capt. Kirk Freeman (M4), and Master Sgt. Russell Moore (M9.) Freeman and Moore are members of the USARCMP. Not pictured is Sgt. Ben Mercer of the USARCMP who finished second overall in the M249 event.